Innovation has led to the debate on privacy being more heated than ever before. Customer data is being used to provide improved products and services but at the same time this data can be social engineered for less admirable purposes. The rapid collection of data has created the need for a trustworthy system for businesses to efficiently and effectively handle data rights. Trunomi is a customer consent and data rights management platform that allows businesses to be on top of their compliance requirements when it comes to customer data. The company’s solution ensures that business conform to EU GDPR and ePrivacy Regulation as well as other global privacy laws. 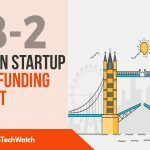 London TechWatch chatted with founder and CEO Stuart Lacey to learn more about the company, its future plans, and its most recent round of funding which brings it total funding raised to $13M since its founding in 2014. Trunomi unlocks the power of customer data using consent and data rights. Trunomi provides customer consent and data rights management technology which enables businesses to request, capture and immutably prove the legal basis for processing customers data. We enable businesses to comply with EU GDPR & ePrivacy Regulation, global data privacy laws, automate compliance and replace inefficient and costly legacy approaches. For the end user we provide control and transparency over how their personal data is used, empowering them to share more data. Our platform is an enabler of the evolving personal information economy and we provide key enabling technology for a more flexible, transparent, empowered and customer-driven world. What inspired you to start Trunomi? Prior to Founding Trunomi, I spent over 15 years in financial markets and compliance management and recognized the major burden of compliance for financial service providers and the convergence of data privacy regulation, technological innovation and changing consumer attitudes to data ownership and transparency and control. This was further evidenced by the entrance of the General Data Protection Regulation (GDPR), first proposed in 2012. The GDPR will be enforced from 25 May 2018 and revolutionizes the global data privacy landscape, and gives individuals greater control and transparency over their personal data and calls for businesses to be accountable in data use and raises the bar for the lawful processing of personal data. 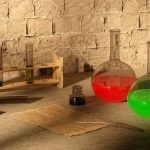 Compliance will require more than technical solutions, as it will be necessary for business to change their mindset and culture to one that recognizes the primacy of an individual’s rights and ownership over their data. I believed this quantum shift was poised to revolutionize the global data protection landscape — and strengthen and empower individual’s data rights, with an emphasis on consent and control. Based on this belief, I founded Trunomi in 2013. 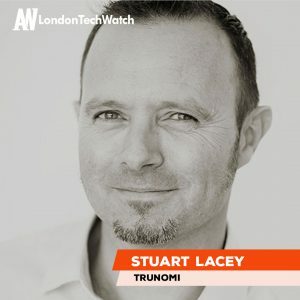 Trunomi is solving the huge compliance burden in a unique and revolutionary way; by empowering customers to manage and safely share personal data, with consent and control and trust and transparency. Trunomi does not see or hold any customer data, and implements with existing applications and identity and access management protocols. Trunomi believes that ‘consent is king’ and that creating a rich, recent and relevant data flow between subject and company will be a huge value proposition to businesses in the future. Trunomi was built with this in mind and, through easy and engaging interfaces and widgets, aims to build a trusted framework through which individuals will feel comfortable sharing their relevant data. Organizations that are processing (collecting, storing, sharing) personal data of their customers – for now with a particular focus on companies who have customers based in the European Union and fall under the GDPR regulations. This driver is quickly expanding globally as 17 of the G20 nations already have similar data privacy laws or commitments to bring them to market soon. We work with large multinational financial institutions all the through to SME type businesses across all markets and verticals that depend on customer data to help manage their services and offer products. In particular we have recently seen huge interest from Marketers who need to ensure they have the correct consent in place to contact their customer base and to subsequently personalize services and offer a much more rich and contextually relevant experience. Annual subscription model – we price per data subject / end user. How will impending privacy regulations in Europe affect your business? Privacy regulations are our business! Trunomi can turn regulation from a burden to a competitive advantage and future proof regulatory compliance for upcoming changes: EU GDPR ePrivacy Regulation, Open Banking, PSD2. Trunomi has oversubscribed every round, including its recent completion of its Series Seed Extension round in February 2018, where we raised an additional $4.6 million. In the early days, there were more thought leadership and futurist type investors who could see over the horizon backing us. In the past 12 months this has fundamentally changed as our business and the market has exponentially grown and the media has caught on to just how vital this is. As such, data rights and consent systems are now mainstream attracting interest from VC’s and investors across the board. The recent hype around ICO’s definitely has entered our space. Perhaps for new entrants this might be an option, but Trunomi has partners and customers whom are Fortune 500 listed brands and does not believe an ICO to be a viable solution. Equally, Trunomi does not need to raise money, it wants to add shareholders who can provide advice, knowledge, guidance and massive network efficiencies. These are not available through crowdfunding or ICO’s, and the best option by far for a more mature company like ours is highly regarded and very experienced / connected Venture and strategic investors. Our first to market thought and technical leadership over the past 5 years, our very strong and competitive brand and foothold in the marketplace, our large list of Fortune 500 partners, resellers and customers, our patent portfolio, team and reliability to solve key pain points with elegance and velocity. 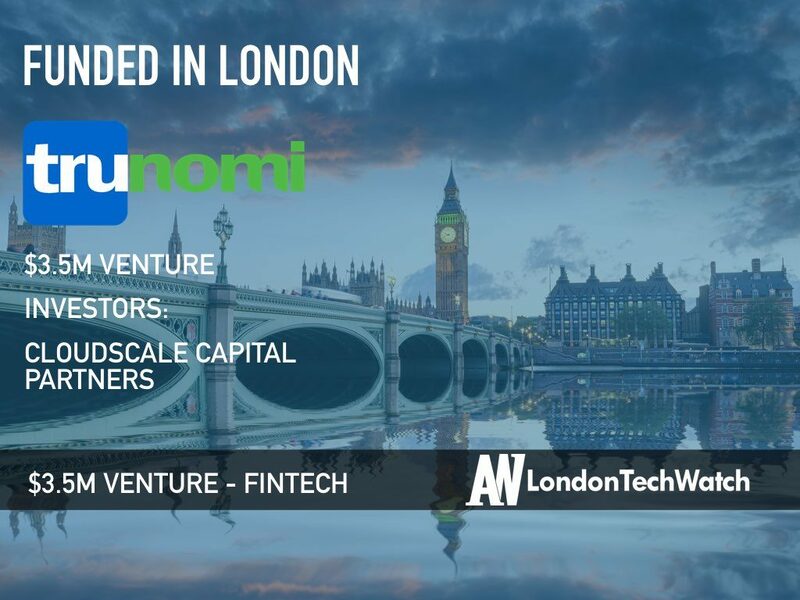 Trunomi will use the financing to help manage the rapid increase in demand for its technologies and to continue its global expansion. It’s not about the money, and never should be. Secondly, the best investors invest in “lines and not dots” so don’t show up only when you need money. Build relationships with investors that endure over the long term and before you need them. 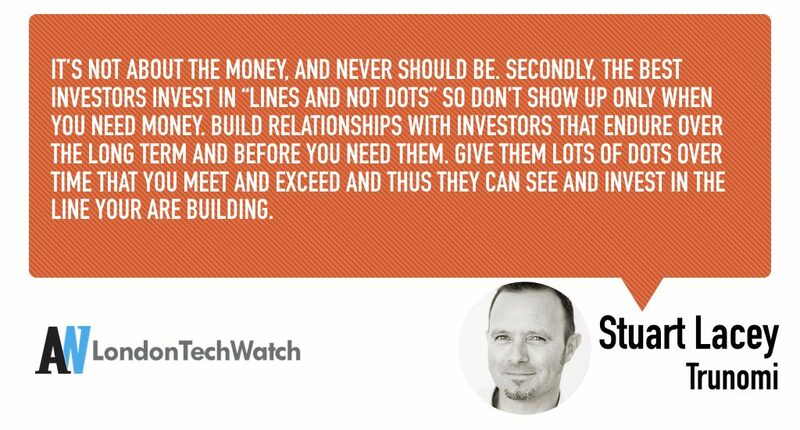 Give them lots of dots over time that you meet and exceed and thus they can see and invest in the line you are building. We are now seeing the arrival of massive global players into our space. Partner? Acquire? Defend? We will only know this as it arrives. For now, it’s all about reinvesting in our team, delivery and technology – and scaling our services and delivering exception time to value for our customers. Our favorite team happy hour is at our London offices – Barclays RISE in Shoreditch have weekly members happy hour (pizza & beer!). It’s a great place for the team to unwind and meet other innovative startups.